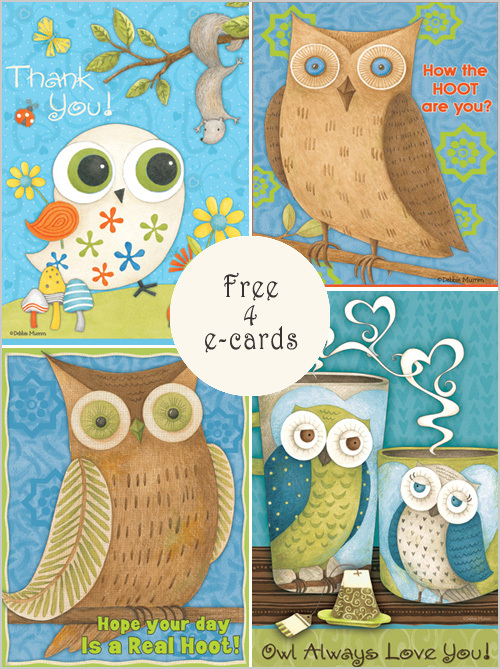 These cute owl e-cards are free to send right away to your loved ones with text like "Thank you! ", " How the hoot are you", "Hope your day is a real hoot! ", and " Owl always love you!". These are designed by Debbie who is an artist and a designer based out of Spokane, WA. Her designs can be found on kitchen products, homeware, cards, fabric, giftwrap and more! You can bookmark this post for sending a card later or send one now by going to this link. There are over 60 e-cards designs for every occasion.